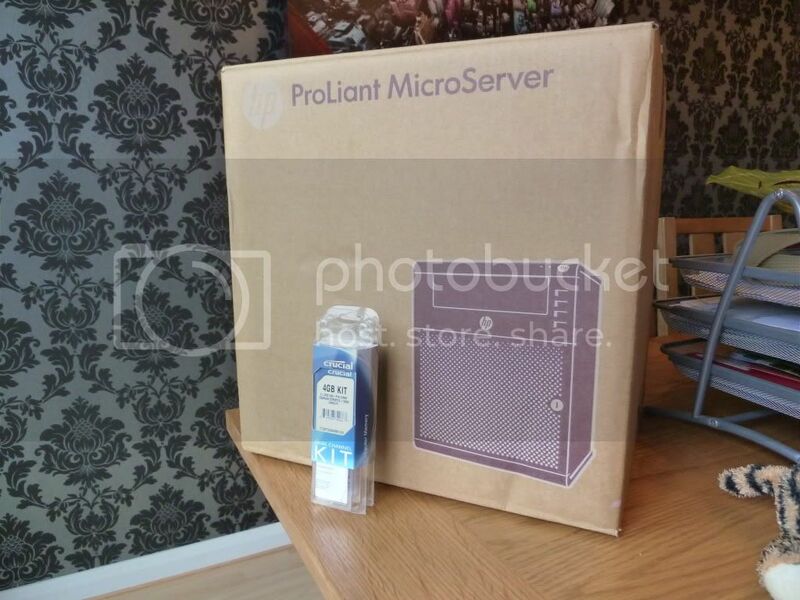 Due to the recent offer at ebuyer for the HP ProLaint Microserver for only £129.99 after cash back I was finally able to convince the misses to let me buy my own server. 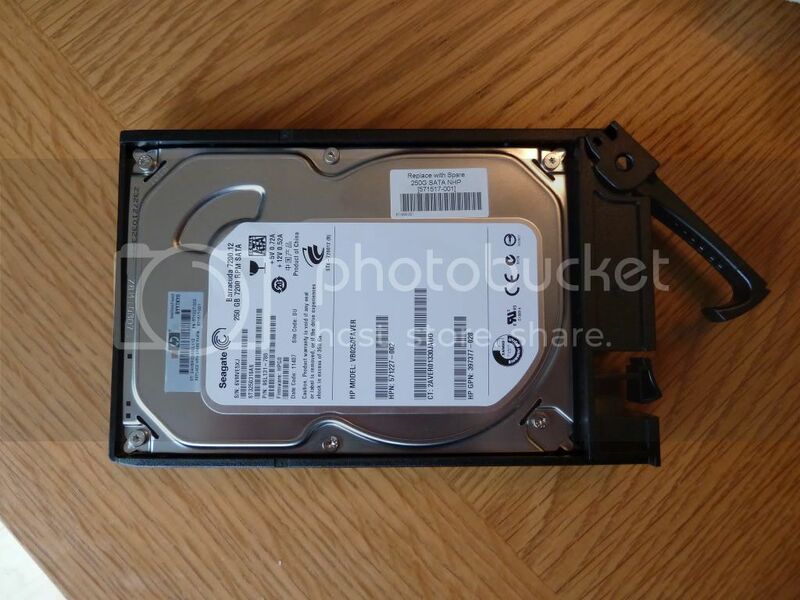 It comes supplied with this HDD and 1GB of EEC memory, both of which are a waste of space and it could retail without these but a little cheaper. The whole top panel comes off to allow access to the ODD bay which will eventually hold the two drives which don’t fit in the slide out bays. 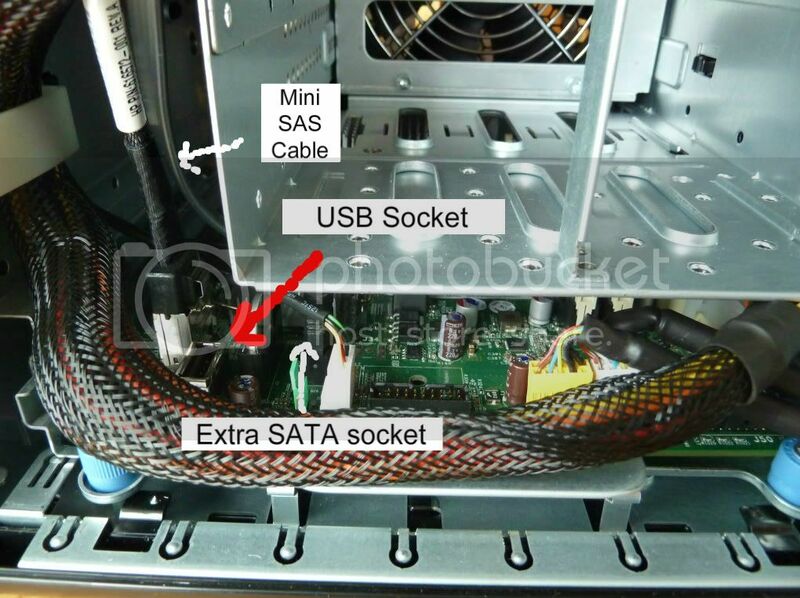 To get the most out of this little server the internal and external SATA sockets have to be used to provide 2 extra HDDs data connection when seated in the ODD bay. If you slide the board out (to do this you will need to disconnect the Mini SAS cable for which you will need a jewellers screw driver as it is very stubborn) you will see it comes with. 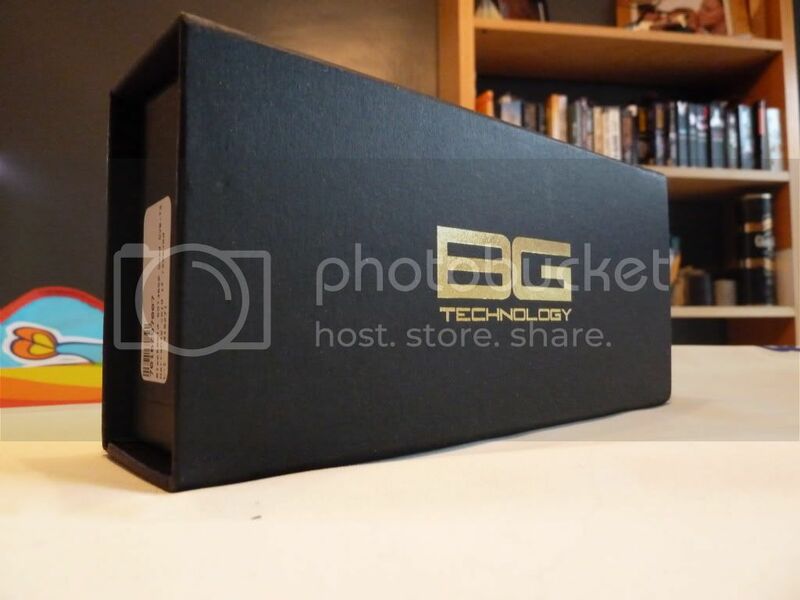 Mmmmmm BlackGold 3650 quad DVB-t2 card so now I record 4 HD streams of HD rubbish! I will be using a copy of WHS 2011 as it is just so cheap but also integrates very well as I have a almost completely windows centric network. It will back up my local PCs and even allow remote web access of my files. In fact I still have not bought my copy of this yet as I just installed a copy from usenet and keep resetting the trial period like you can in W7 so I have 120 of use before I have to buy a copy. a Open Source Binary Newsreader written in Python. 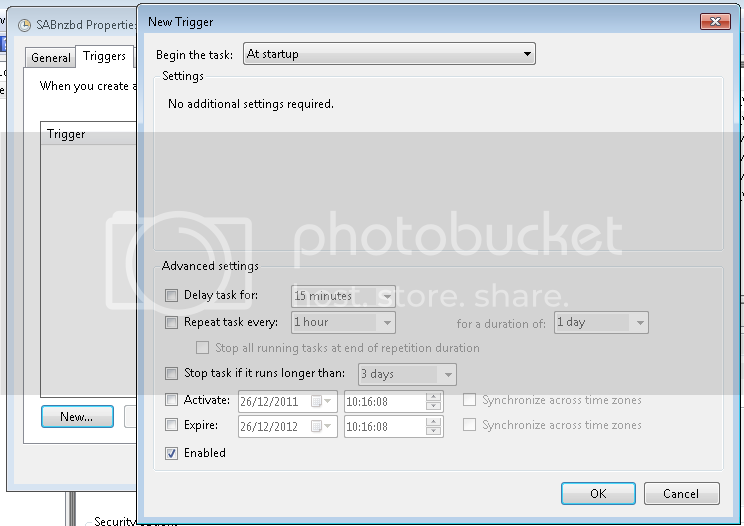 CouchPotato is an automatic NZB and torrent downloader. You can keep a "movies I want"-list and it will search for NZBs/torrents of these movies every X hours. Once a movie is found, it will send it to SABnzbd or download the .nzb or .torrent to a specified directory. 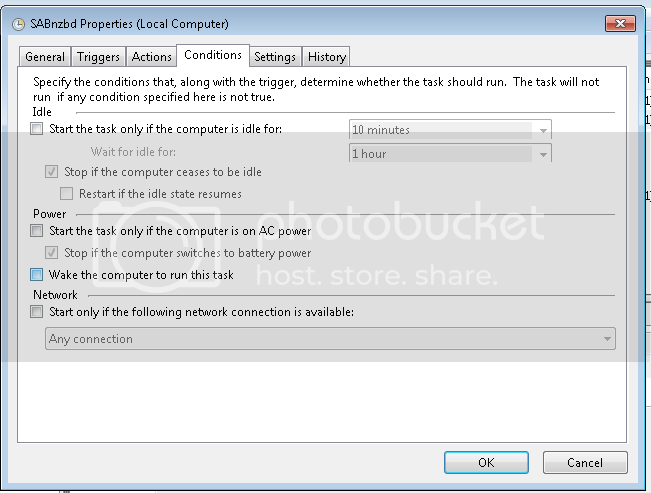 Couch Potato Install, Setup, & Configuration Guide for Ubuntu & Linux Mint! : Ainer.org — Counter-technology Guides, Information, & News! Featuring Linux Mint & Ubuntu, SABnzbd+ & Sick Beard, Couch Potato & Headphones, XBMC & more! Headphones is a SABnzbd add-on that automates your music downloading. It's written in Python so it works on pretty much all systems, and it's easy to setup and configure. You can import all your favourite artists from iTunes, and keep an eye out for any new albums they might be releasing. 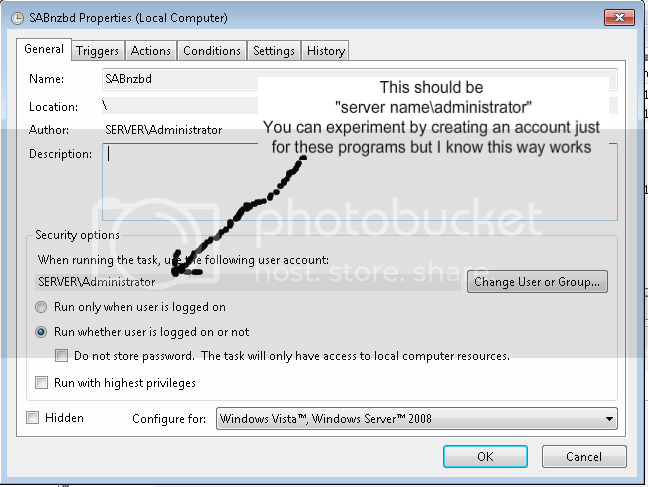 It can be configured to work with a few search providers, including NZBMatrix, NZBs.org and Newznab servers. Just enter your account details and you're ready to go. 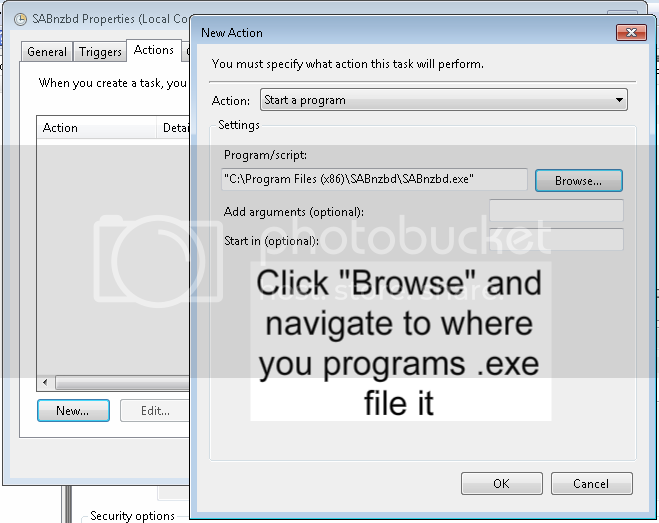 All of the above programs can be administered over you local network via a web browser. Now your biggest problem with WHS is the fact that it is headless so when you switch on the server no users get logged in. 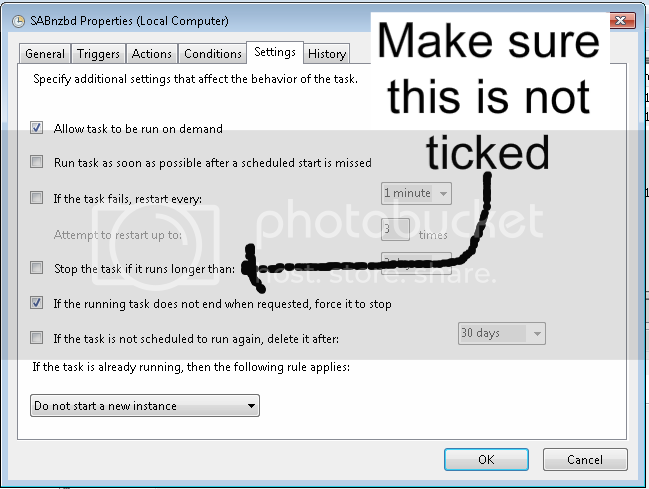 This means that any programs set to start automatically will not start up. Now that I see the inside, I have to say that is a pretty sweet box. 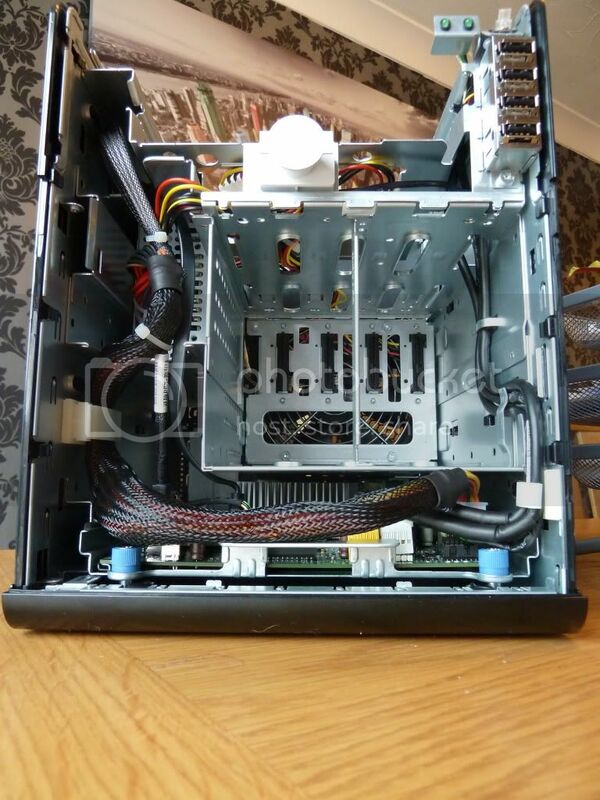 I can even see how more drives can be fitted in a with a few mods. The limiting factor is going to be the PSU. Do you have kill-a-watt figures on the system? Idle? Boot? Load? Sweet. I wonder about the thermal properties of the whole thing if you fill it up with (spinning) disks. Yea could get pretty toasty but the fan moves quite a bit of air and I would have no problems swapping it out for a higher rated one. From what I have read drives like to be slightly on the warm side anyway? Should not worry too much as there is no way I can afford to fill it up anyway! When you first install Sab, it should give you the option to load on startup. 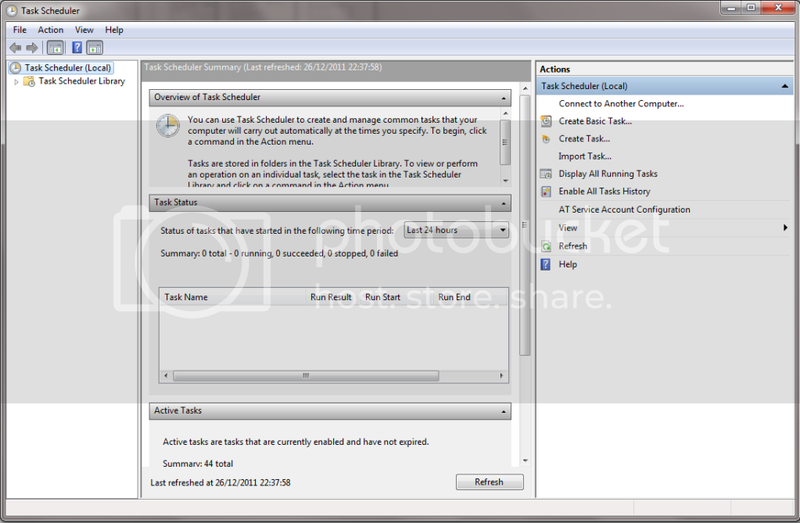 Shouldn't need to use the task schedule unless you also use SickBeard. 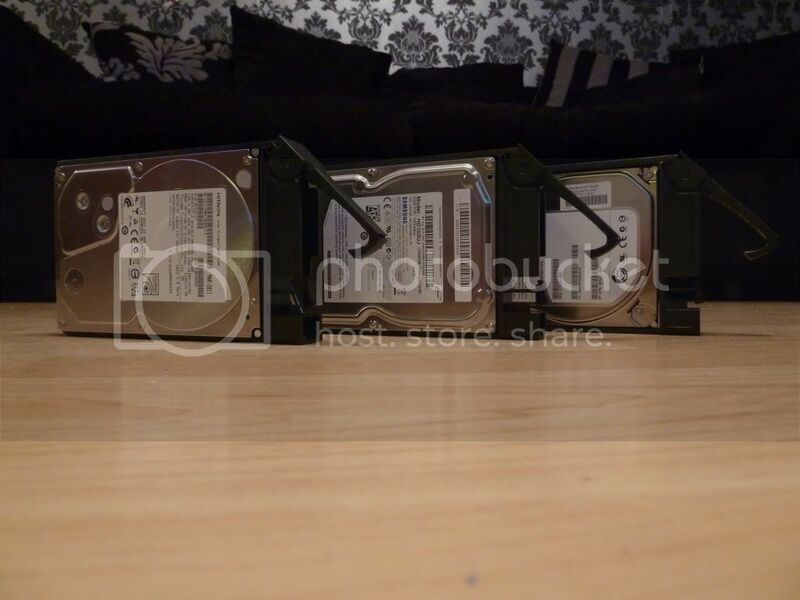 I'd like to mount a 6th disk internally, and so am interested in your ODD mounting kit. 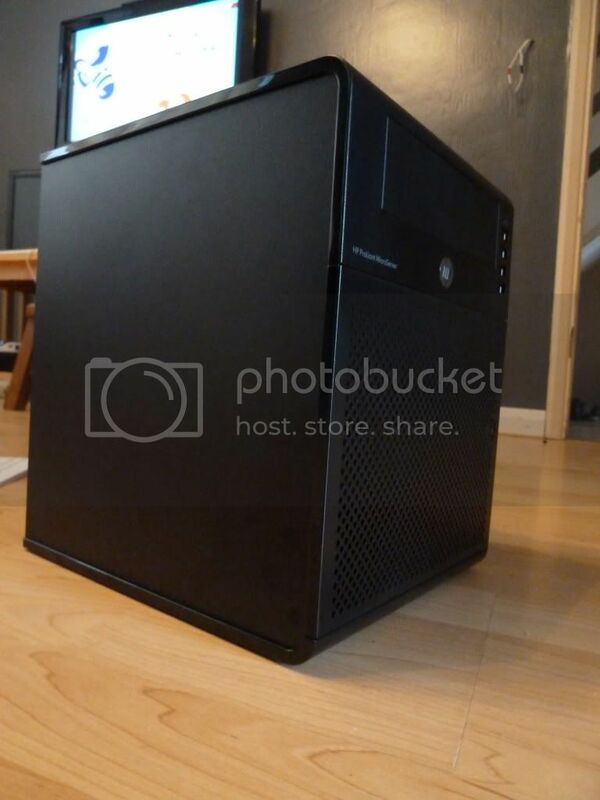 Given that you bought your MicroServer from eBuyer (as did I), I assume that you are UK based. Where did you buy it? Not been able to find this in stock anywhere. 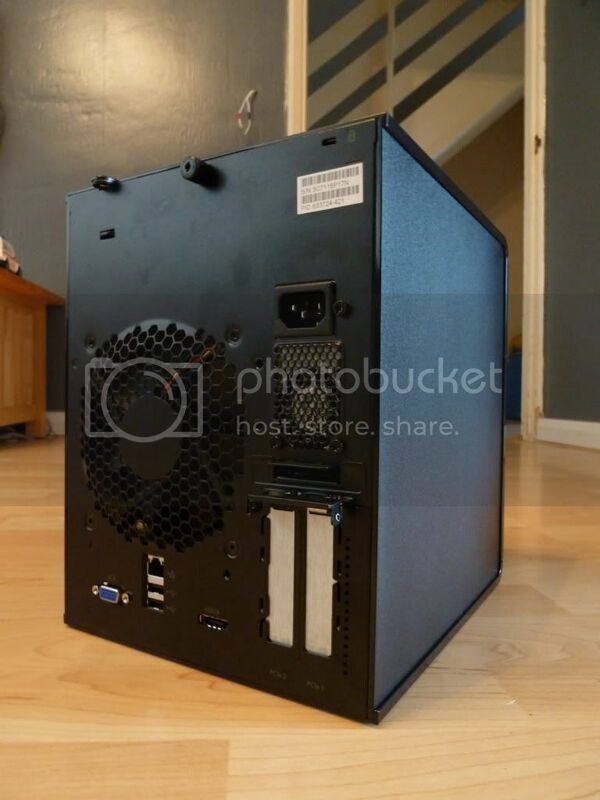 Mine only has a 200W PSU. I'm concerned about whether this would be up to 6 disks (I use a mix of WD Caviar Green and Seagate Barracuda Green). Thermal is not a problem; the fan is brilliant. I re-used an old XP licence; to install you have to set the BIOS from AHCI to IDE. I've not yet had any success at re-enabling AHCI post install. It is apparently possible. There is also a modified BIOS around to up the default speed for the ODD (which was intended primarily for a CD/DVD drive). 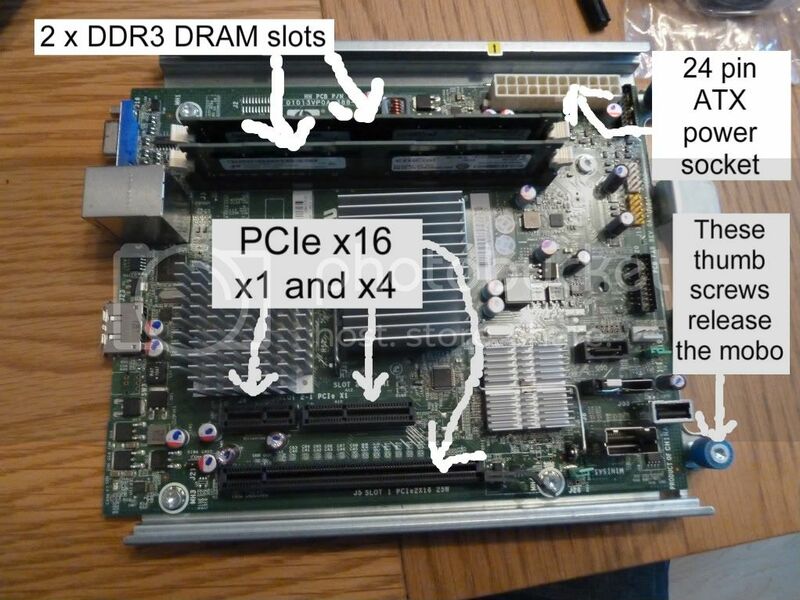 Have you considered this (see AVforums or Google TheBay MicroServer BIOS). 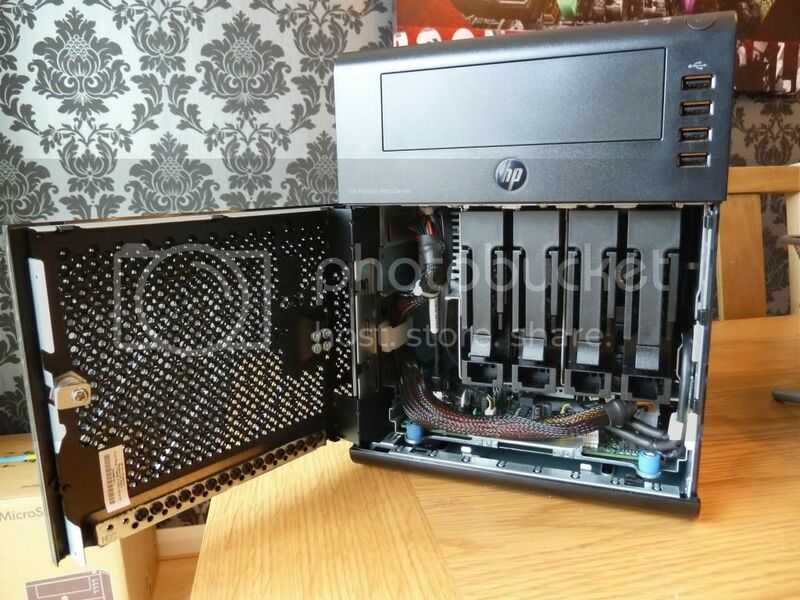 Finally has anyone found a supplier for additional/spare HDD carriers - a set of four from the only supplier I've found (on eBay) would actually cost more than a new MicroServer. And we're only talking about a pieces of plastic! I would be interested to hear other's experiences. Great machine!!! I ordered mine one week ago and I LOVE IT. 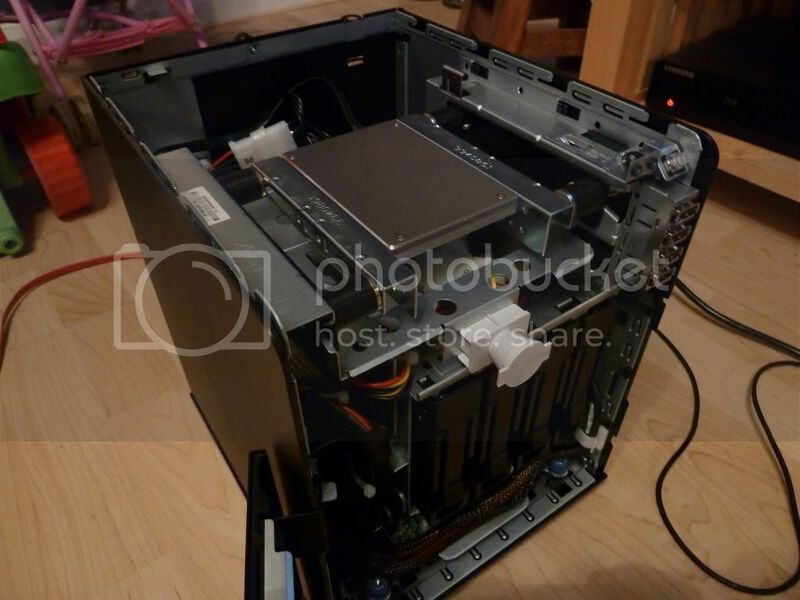 I'm from spain and here I got an offer of 160€ for an N40L fitted with 4GB (on one module) and DVD-Writer, no HDD included in this version. I put in it two WD20EARS, at full load consumes around 40W and the best of all it that's almost dead silent. I rerouted the backplane power cables using the same space for the backplane data cables and planning to put in it up to seven HDDs using a Nexus Double Twin and a controller card. As far as I know, with the latest bios from HP is not necessary to use a modded bios, but you could use a modded one for fun. I'm using original HP bios and getting correct performance from all sata ports including the ODD sata port and esata port. nymrod says he is drawing 40W with two drives. I would peg each additional drive as 10W so it should be more than happy! I re-used an old XP licence; to install you have to set the BIOS from AHCI to IDE. I've not yet had any success at re-enabling AHCI post install. It is apparently possible. There is also a modified BIOS around to up the default speed for the ODD (which was intended primarily for a CD/DVD drive). 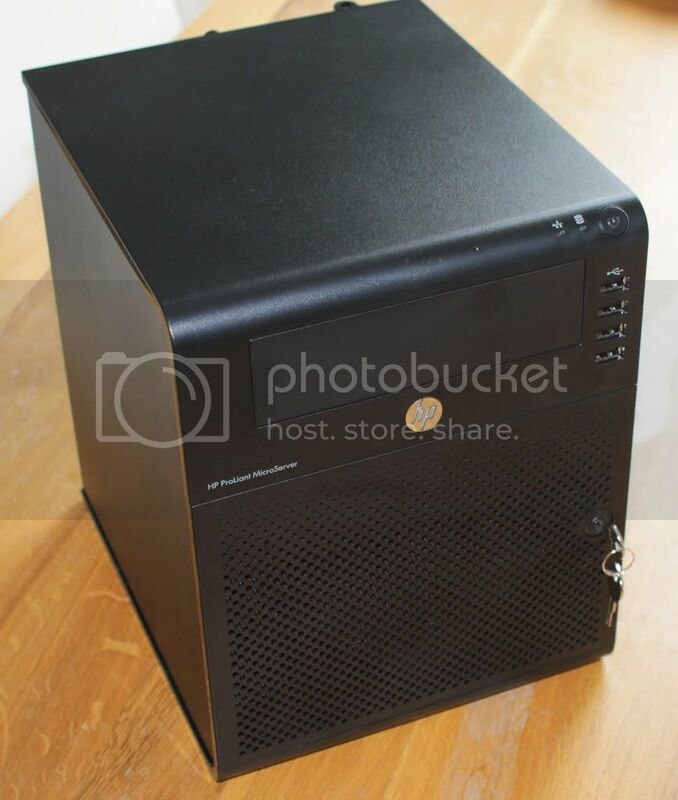 Have you considered this (see AVforums or Google TheBay MicroServer BIOS). Yes I'm running the original Russian modded BIOS as I flashed it a long time ago. It allows the extra sata port to work in AHCI (full SATA transfer speeds) mode and not just IDE speeds. Thing is if you stuck in IDE mode bacause of XP then yu will not see any speed increase from flashing. But if you can sort you XP install (or buy WHS 2011 as it only costs £40 and has none of these problems) then it is easy to de with the HP flashing tool and its well worth it in my opinion. A few month's ago, I flashed mine using the latest official HP BIOS (ver 041 2011.07.29 25 Aug 2011); haven't noticed any difference with the ODD drive, but then this only holds my OS and what with 4GB RAM (yes I know some is waste 'cause I'm only 32bit XP) I don't suppose it gets much use. I'll try some performance benchmarks somtime. The latest TheBay custom BIOS is based on this; the Russian copy pre-dates the latest HP copy; it's actual base is unknown. F6 doesn't work if installing from USB drive. I've also tried slip-streaming the driver into my XP install; I couldn't get this to work either. I missed this post; good news. I've got an HP NL40 with 8Go ram and I've got a question about network performance when using flexraid. I am now copying 180Go of music from a PC of my network to the flexraid pool, and I only got a 28Mo/s transfert rate with a 80% CPU use. When I copy the same thing to the D/: disk (witch is not in the pool) I've got a 70Mo/s transfert rate and a 60% CPU use. those are the performance I can wait from flexraid? or do I have a problem in my config? Not sure how you can improve your RT speeds as it is going to be CPU limited but I did see something about changing the number of threads FlexRAID uses which may help?